Robert Rossen named names to the House Un-American Activities Committee — fifty-seven of them. Then he went to Italy and made this ponderous film. 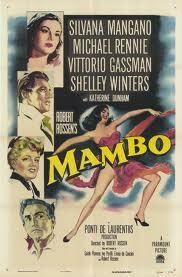 Mambo (1954) is a mishmash of neorealist solemnity and “women’s picture” melodrama. The actors all seem to be holding back, as if they too found the story implausible. The dancing scenes lack joy. Rossen himself considered the movie a failure, and yet he poured his heart and soul into the project. “I got involved, took it seriously, but it just didn’t come off,” Alan Casty quotes him as saying in Robert Rossen: The Films and Politics of a Blacklisted Idealist. No, it didn’t work as a movie, but as a cri de coeur, Mambo is strangely compelling. Here is Rossen’s attempt to justify his betrayal of his former comrades, an anguished plea for understanding, if not forgiveness. He can’t forgive himself, you see, but as we watch his confused heroine Giovanna (Silvana Mangano) abandon her dreams and her integrity under the sway of her ne’er-do-well lover Mario (Vittorio Gassman) and her dissolute aristocratic admirer, count Enrico Marisoni (Michael Rennie), we can’t help but notice Rossen’s remorse. Like many Jews who made their way to Hollywood in the 1930s and 40s, Rossen was drawn to Communism. The Party was “dedicated to social causes of the sort that we as poor Jews from New York were interested in,” he told his son, and his early scripts featured working-class characters and explored big themes like bigotry and injustice. But after the war, he grew disillusioned with Communism’s monolithic structure and left the party, as did many others. His Academy Award-winning adaptation of Robert Penn Warren’s novel All the King’s Men (1949) gives a more jaded perspective on working-class heroism, showing how easily even noble ideals can be corrupted. But Mambo demonstrates that Rossen had not abandoned his idealism. He used Katherine Dunham’s interracial dance troupe for the mambo scenes — this in the segregated pre-Civil Rights era — and he has Ms. Dunham herself instructing Giovanna on the virtues of hard work and rigorous training, belying the general perception that such “primitive” dance forms came naturally to African peoples. At the end of the film, after she has caused the deaths of two people, Giovanna seeks salvation through rejoining Dunham’s troupe and losing herself in her work. Rossen was initially called to testify before HUAC in 1951, and had taken the Fifth. Blacklisted, he had two years of unemployment to reconsider his principles and when he was called again in 1953, he caved in and gave the committee what it wanted. “It killed him not to work. He was torn between his desire to work and his desire not to talk, and he didn’t know what to do,” his son explained. After Mambo, he went on to make six more films, including the epic Alexander the Great (1956) starring Richard Burton, Island in the Sun (1960), a controversial story about interracial love in the Caribbean which featured Dorothy Dandridge and Harry Bellefonte in serious roles, and The Hustler (1961) with Paul Newman and Jackie Gleason, now considered a classic. Akin to the flawed Giovanna, work figured in Rossen’s salvation, I would say.